The Horror Movie BBQ: Essential Freddy Krueger Merch! 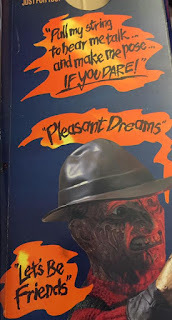 So, while yesterday I didn't present a writeup on Dream Warriors like I originally wanted to, I decided today to take you down a somewhat different path. 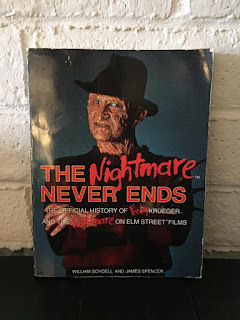 Today I wanted to take you on a trip down Elm Street for some of the best merchandise Freddy could plaster his face on. 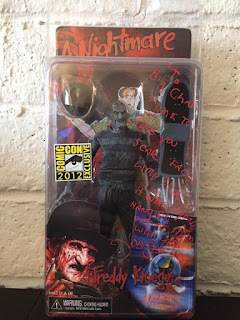 Now, I did a blog post about Freddy merch way back in 2011, but I've really been wanting to do an updated entry since then. Afterall, my collection has grown. Why not revisit it? 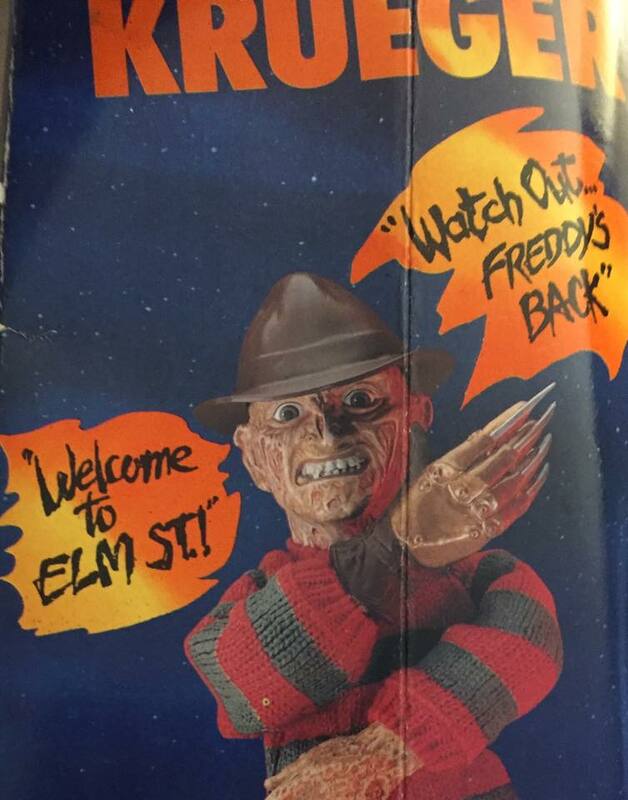 So much like every town in the world, every blog has an Elm Street. Let's take a trip down, shall we? Wow, one of my all time favorite pieces in my collection. Not just NOES related but everything I own. 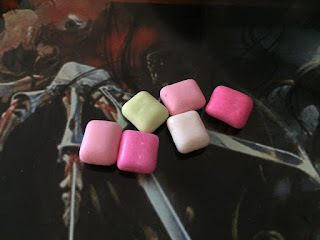 These weird little containers contained pastel colored chiclet-like candies were produced by Topps in 1988 and offered several containers featuring Freddy in different poses and goofy catchphrases that weren't exactly from the movie. 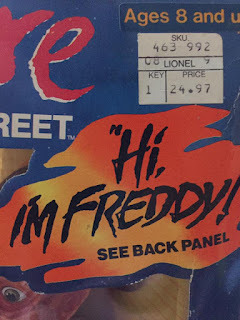 On top of that they had goofy lines like you see above or "Kiss Me" and "The Freddy Nobody Knows" and others that you really can't hear Freddy himself say unless it was on a Saturday morning cartoon. Which, I have to imagine was pitched by this point in the "Freddy-Mania" days. 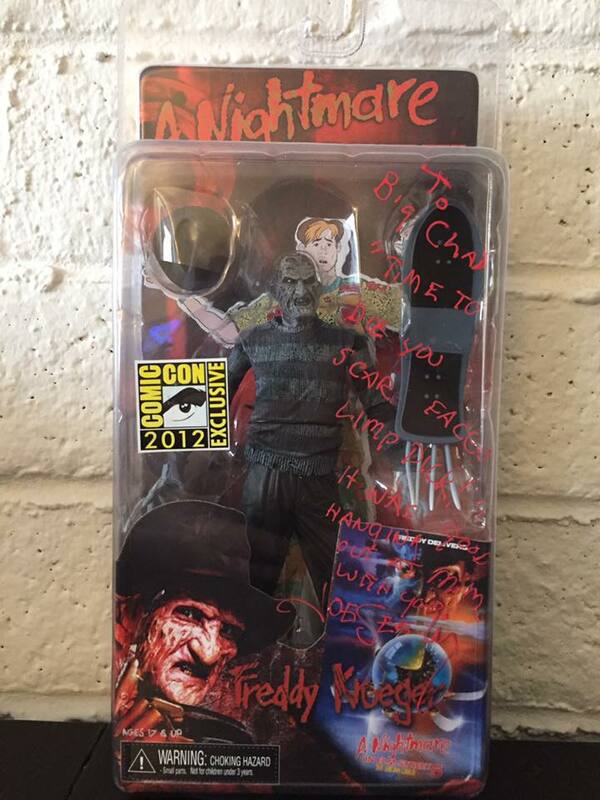 NECA has had a VERY long relationship with Freddy. Sure, they produce killer action figures now, but for a while, they were producing awesome stuff in every other category. Be it, the Gizmo Pillow to Nightmare Before Christmas ornaments to Slimer decorative lights, you name it, they did it. In fact, if you were looking to decorate your house, NECA was your number 1 source for awesome decorations. 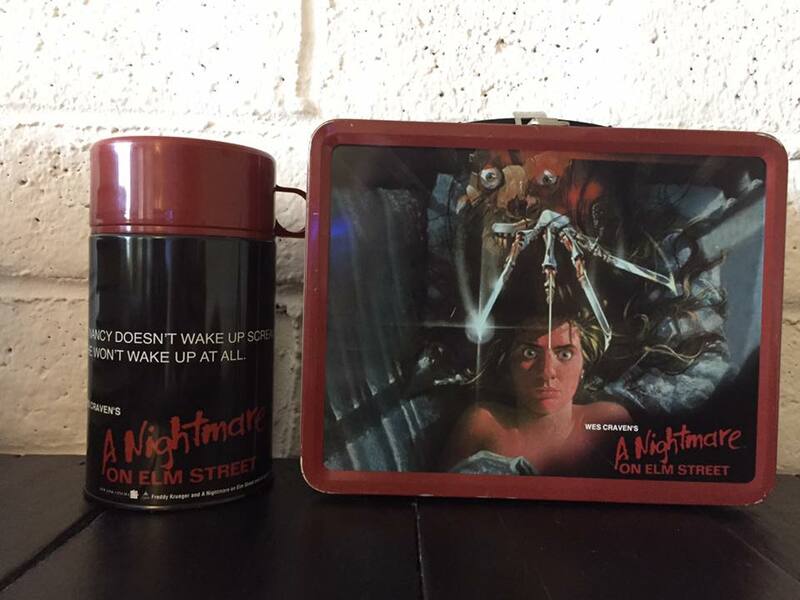 Lunchboxes were a huge part of NECA's repertoire and a lot of great designs were produced. In fact, I had a Beetlejuice and Ozzy Osbourne Bark At The Moon lunchbox as well, but of every lunchbox offering, this one is by and far my favorite. The iconic poster to the first movie adorns not just the lunchbox itself, but the thermos as well. This tin lunchbox has been a favorite piece of mine even way before my lovely fiancee picked on up for me as a gift. 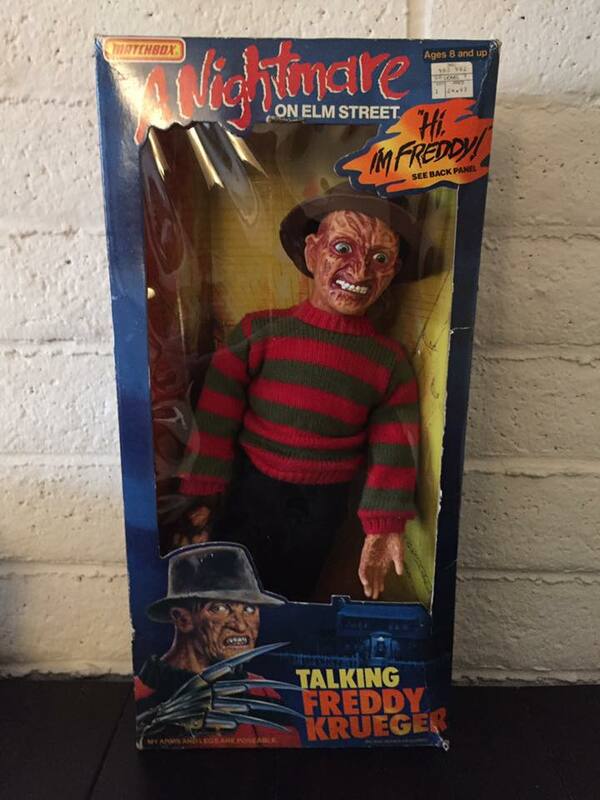 Plus, there's just something so rad about taking a Freddy lunchbox to work. Thankfully, when you're 6'6, no one questions it. 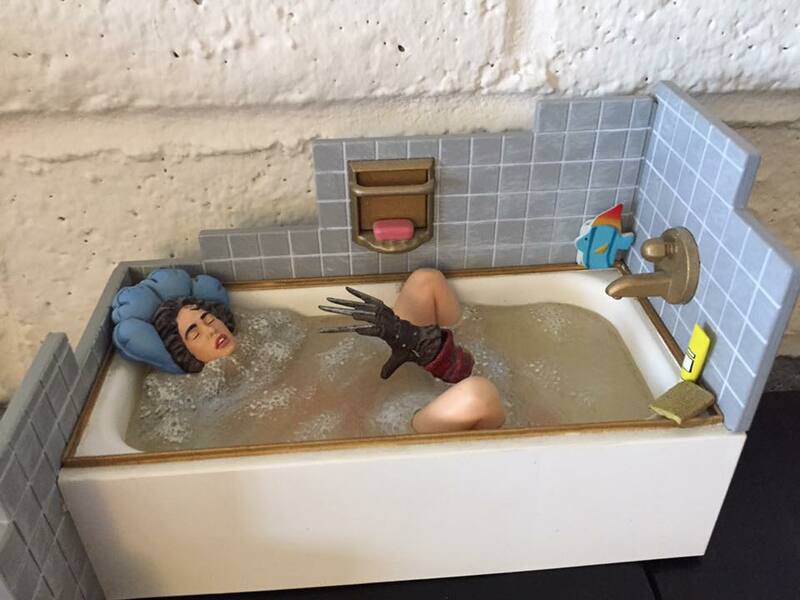 There is a huge void in our lives of Nancy Thompson merchandise. To date, this and another diorama from Cinema Of Fear are the only action figure representatives of Heather Langenkamp's iconic role. 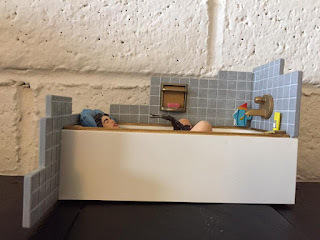 It's a great figure/diorama recreating the famous scene from the first movie that makes a perfect display piece on my shelf. As much as I love this piece, I'd love to see more Nancy merch hit shelves. 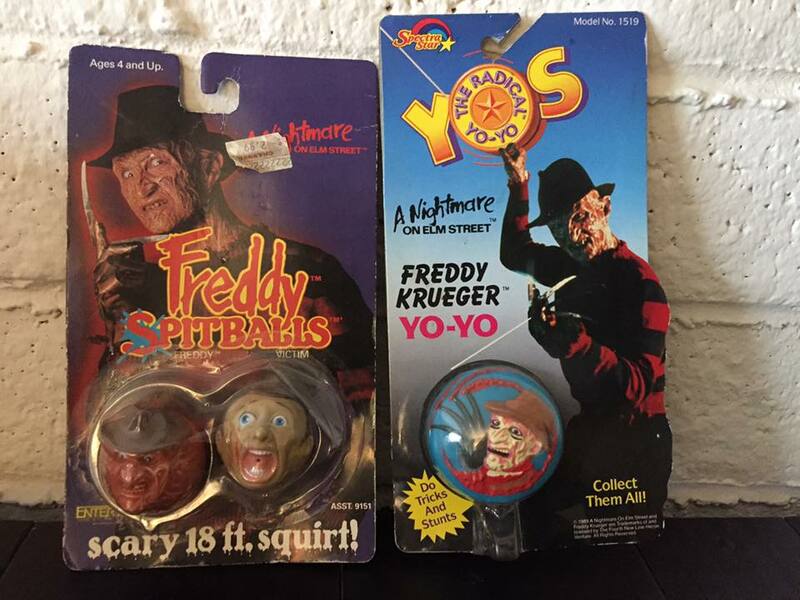 Imagine an "Ultimate Nancy" figure to combat all those great Freddy's we've gotten over the years. First up, the McFarlane Freddy from the Movie Maniacs line in 1998. 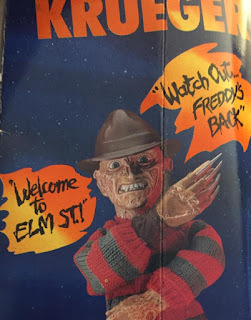 At that time, McFarlane was releasing some of the most creepy figures on the market. When the company announced they were producing a line based off famous slashers, I was overjoyed because I knew I'd get a new Freddy. 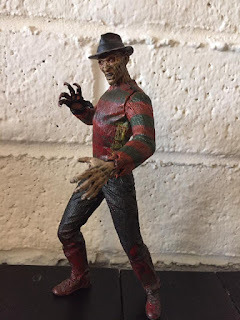 Freddy has a great pose here and looks so beyond creepy. It may not be his most accurate face sculpt but it certainly looks unique. Love the paint job and sculpt. 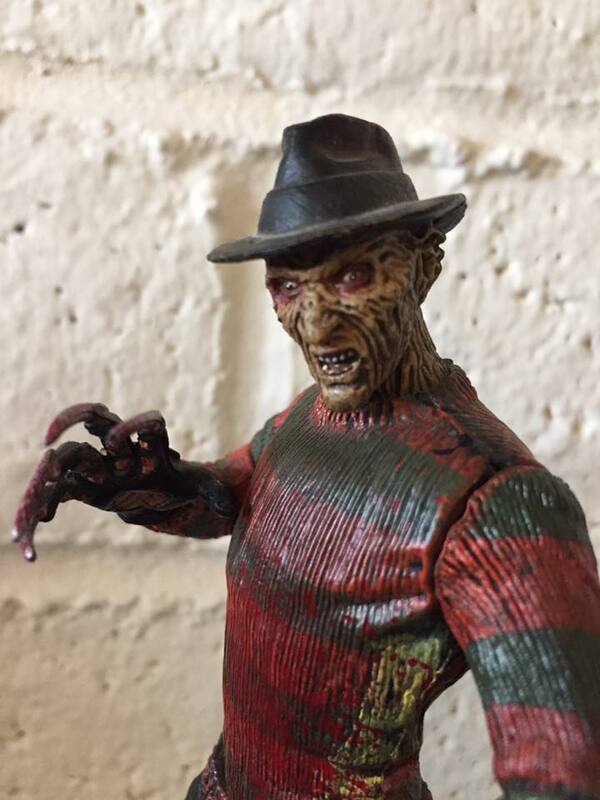 Definitely my favorite Freddy figure to date. 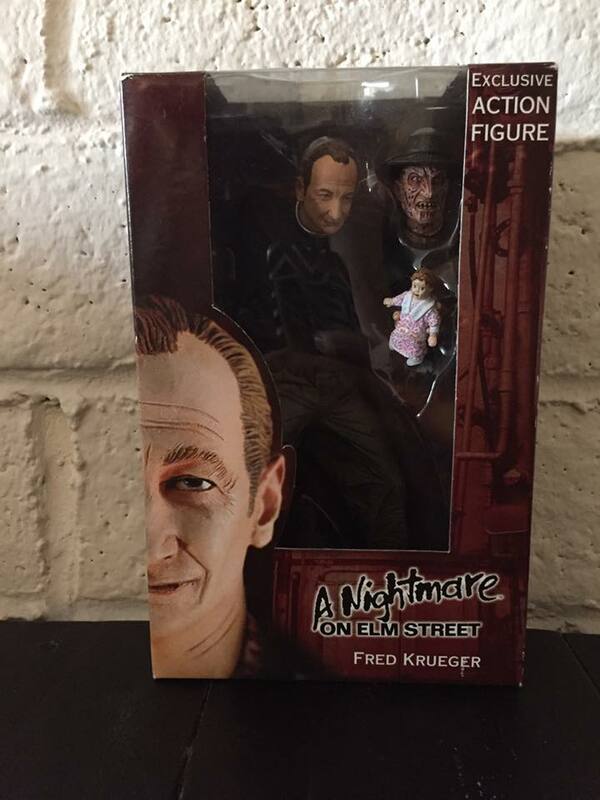 In 2003, conventions across the country offered this exclusive Fred Krueger figure by NECA as a way to build excitement for Freddy vs Jason. 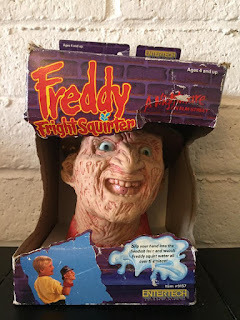 We had seen multiple Freddy figures by this point but until 2003, we had never gotten a FRED. Using a great sculpt that looks so much like Robert Englund, you'd think it's actually him, a creepy accessory of a baby doll (to entice his victims) and an alternate Freddy head, this is my favorite Fred figure. 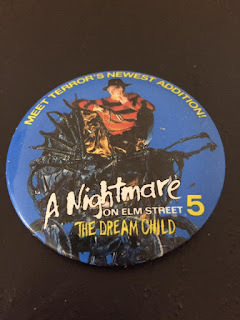 As I said before, Elm Street 5: The Dream Child is my favorite entry of the series so when NECA announced a Comic Con exclusive of Super Freddy and a cutout of my favorite character, Mark Grey, I knew I had to own one. I love the originality of this figure and in fact, had to have actor Joe Seely sign it for me! So this figure is even more special to me! Movie promo buttons have always been a favorite collectible of mine. When I was a kid and I'd go to the video store, I'd always walk away with pins and keychains and posters I'd prolly never see, but come on a free button? That's what I looked forward to the most. 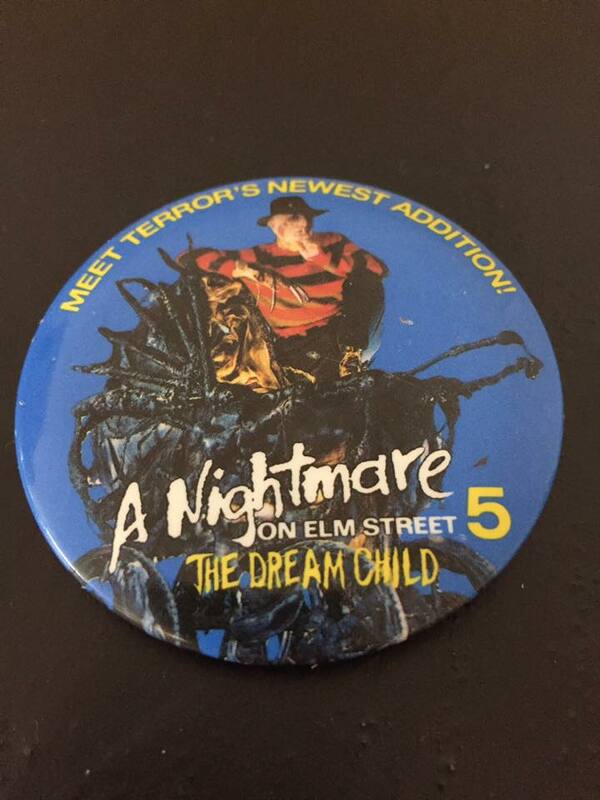 Sadly, I never got a NOES button as a kid, but at my first Monster Mania convention in 2008, I found this beauty for only 5 bucks. How in the world was I going to turn this down? This remains one of my favorite of my pin/button collection that I've been building since a young age. A valentines day gift to me from my fiancee, I've always been fascinated by this. You stick your hand up his neck, squeeze a bladder and he squirts water. Not very far but it delivers what it promises. I can't imagine Freddy being useful in a water fight in 1989 but hey, it sure looks better than those lame drug store squirt guns. Looking for some indoor fun? 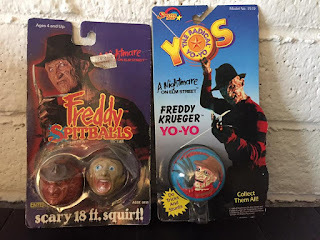 Spectra Star has your best interest in the form of a fun yoyo and Entertech, once again, is delivering some indoor water squirting fun with a "Spitball" in the form of Freddy and one of his nameless victims. Both items were big peg warmers in Kmarts around the country when I was a kid at this time but they've become big favorites to collectors in the past few years. And why not? 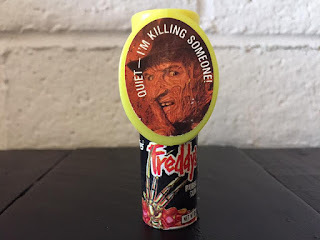 It's so crazy to see a child murderer's face plastered on yoyos and spitballs! Thankfully, I was able to find both MOC, although...I will confess the temptation of having a water war with my friends using these...Hey...why don't you come on by later this week? heh heh heh! Perhaps the most outlandish item in my collection. The fact that Robert went into a recording studio with some random singing group to pound out this album still floors me. It' most certainly wasn't going to be nominated for a Grammy but it's one of the most entertaining novelty records you'll ever hear. I dare you not to love it. To this day, I put this on my "Convention" playlist. I always play this album on my way to any convention I attend. It gets me in the mood and puts a smile on my face. I actually picked this up just five years ago after searching for a good copy. My local record store posted they had one on Facebook and I rushed over. 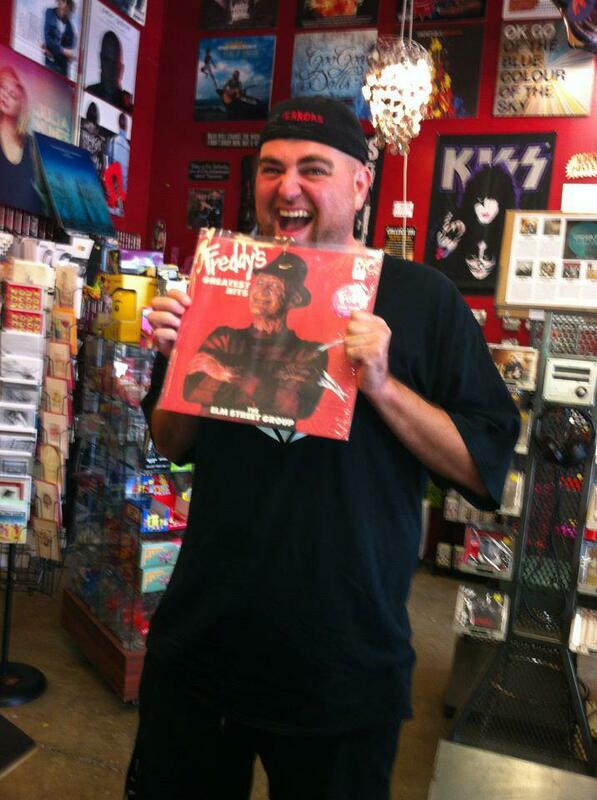 In fact, I think my face shows just how excited I was to pick it up. That's the face of a very ecstatic Fred-Head finding one of his most wanted items! 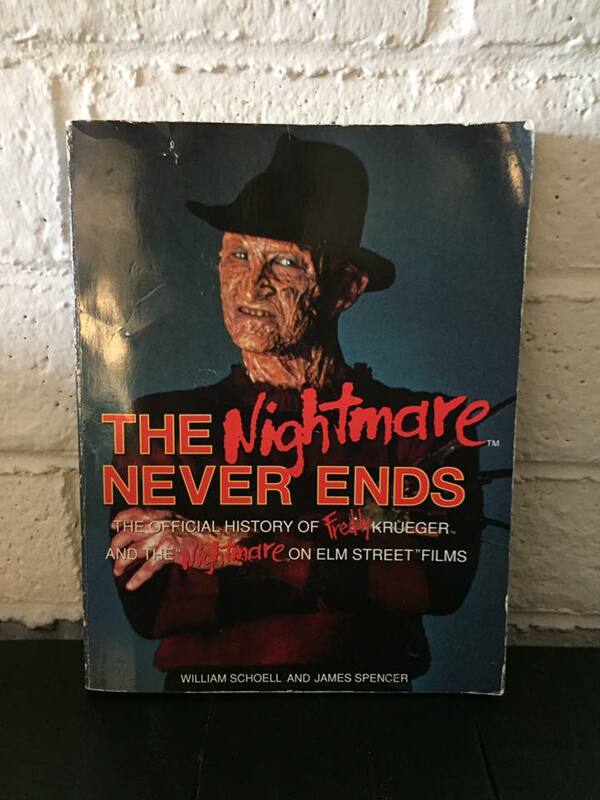 Before the fantastic documentary "Never Sleep Again" was released in 2010, this was our source of the history on Elm Street. 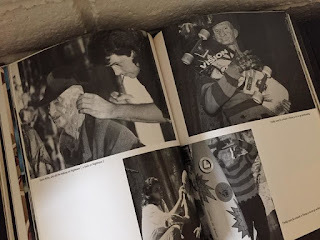 This book provides great stories and never before seen behind the scenes photos from 1-6. I've seen some great retrospective books written before but if you ask me, this is at the top of that list. For the longest time, I kid you not, this was my "Freddy Holy Grail". Why? Because it represents everything great about what Freddy became in the late 1980's. 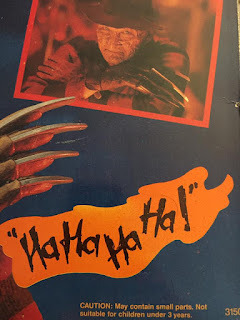 He went from scary slasher to scary cereal mascot slasher pretty quick, which pisses a LOT of people off but for me, since that's around the time I got into Freddy and saw my first NOES movie. So to me, yes it's not what he started off as, but it's what I love about these movies. 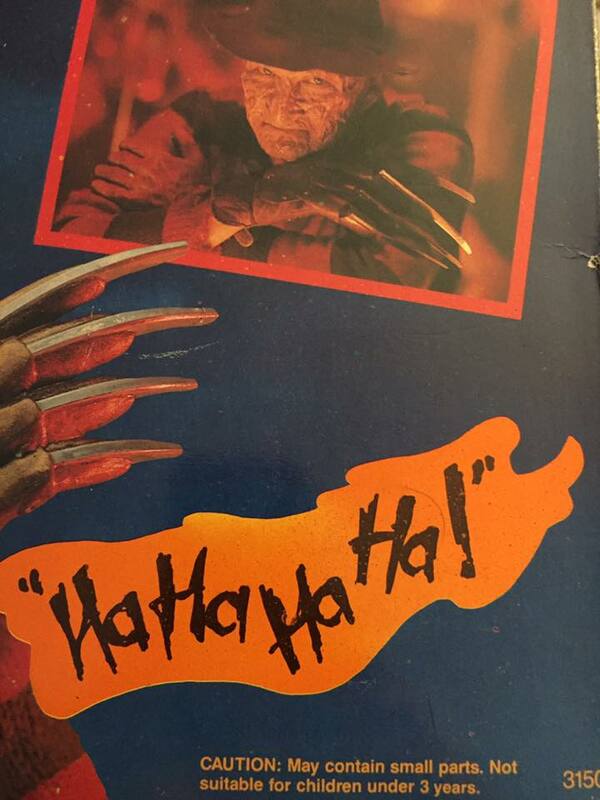 Unlike other slashers, Freddy had personality and unique charisma. That's what I look for in my favorite characters. So there they are, these are just several of my favorite pieces. But what about you? Is there a piece in your collection that maybe I left out? What's your holy grail? Share with me in the comments! BUY ME TOYS! 7 Things I Want From Toyfair 2017! Cheetos Paws Are BACK, BABY! Time To Shuffle With Da Bears! The Great 2017 Thrifting Adventure!